This is a great question. I’m going to address it from the perspective that this is really a question about how we make a transition from one stage in our development to the next. We are already familiar with this because we make these choices every day. Usually it seems that the line that distinguishes what we do and don’t do cuts through responsibilities with family and work. For example, we make the choice to attend our kid’s soccer game rather than going to hear our favorite band play two hours away. It is a matter of our priorities. We desire to be in two places at once. Our priorities and the values that determine those priorities guide our choices. It isn’t to say that these are easy choices, just that what we value helps us more clearly delineate how to manage the competing demands upon our lives. Vickie more specifically asks about giving up things in order for there to be space for growth. Let’s assume that growth is a developmental process. Whether we are referring to personal growth or that of our business, we grow into growth, in other words. If so, then the space we need is of two kinds: time and attention. … the virtues we do acquire by first exercising them, just as happens in the arts. Anything that we have to learn to do we learn by the actual doing of it: people become builders by building and instrumentalists by playing instruments. Similarly, we become just by performing just acts, temperate by performing temperate ones, brave by performing brave ones. To become skilled in any field requires time. It also requires our attention. This means by focusing on how we are to grow and change. The challenge for most of us is to limit distractions. I know people who don’t answer email except at specific times of the day. Others who don’t do Twitter or Facebook in spite of their relational benefits because they are too distracting. Being able to concentrate is essential if we are to learn the lessons required for growth. This is not new or unfamiliar territory for most of us. We recognize that our development as people is a process of transformation from one level of proficiency to another. It is the very linear nature of growth like this that gives us feelings of comfort and security. It seems logical and progressive. Change the context and circumstances and the issue of making choices becomes much more daunting. I suspect that for most of us the growth of our businesses is rarely a simple, logical, linear pattern of development. Instead it is far more random and chaotic, and mysterious. How do we make logical, progressive choices when the business context we are in is anything but stable. Again I return to the idea that we are in transition. 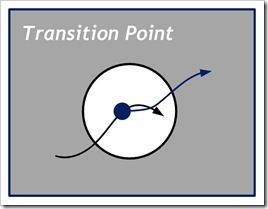 When we encounter a transition point, we know it because our performance drops, our work gets harder, and our confidence to know what to do begins to slip. Welcome to the world we all live in today. We need to identify what it is that we can hold on to and build upon in the midst of the chaos. Embedded in Vickie’s question is the notion that there are some things that we give up and some that we don’t. As I have thought about this over the years, my perspective has changed. 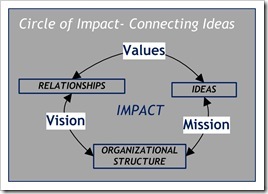 The connecting ideas of the Circle of Impact are the key to managing our understanding of the changes that are taking place. Our Mission and our Vision are ways we understand who we are, what we do, and the impact that we want to achieve. They characterize our identity and our purpose. However, if I lose my job, or, the company where I work closes, or the industry where I’ve spent my career ceases to exist, then I’m thrust into a crisis to identity and purpose. So, my sense of who I am is circumstantial, based on a specific context. This is why it is often hard for retired executives to stay retired. Their identity is wrapped up in what they do, and when it changes it creates ambiguity about what their life means. I’ve learned that we can change the perception of our mission and our vision as we move from one organizational / social context to the next. Many of the skills and qualities that we learn as Aristotle’s apprentice are transferable to other settings. We can change, grow, be transformed into a new person or our business be totally reborn without losing who we are. It is possible to remain a whole person in the midst of these transition points because we are clear about the values that govern our lives and work. For example, if my values are centered in being a collaborative person, then what I give up when I make changes are those things that do not support collaborative activity. If integrity is an important value, then we look to stop doing those things that are fragmented and non-contributing to being whole person or providing a holistic relationship to our clients, customers and employees. I’m going to look for ways that my personal life and my work life are integrated to create greater strength for me and the places where I’m involved. If achievement is important, I’m going to look for ways to be more strategically focused on the impact of my actions, rather than simply being active in doing things. The clearer we are about our values, the easier it becomes to adapt to changing circumstances. Our mission and our vision for impact are informed and clarified by our values. It is to the degree that everything can change as long as our values remain the same. Here is one example to describe this reality. Dayton Power and Light (Ohio) is a client of mine. At the early part of the decade the company went through a leadership crisis. After a period of time, new President and CEO Paul Barbas arrived to lead the company forward. The Board of Directors and Paul instituted a values process to reorient the company toward those values that could lead them to greater strength and impact in the future. I came in to work with a team of executives and union representatives on the development of a values statement for the company. 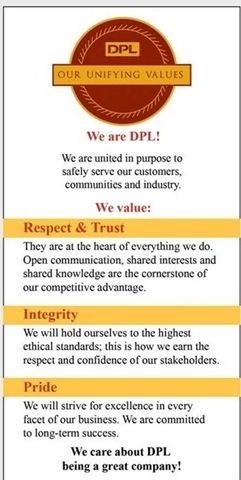 The overwhelming impression that I have from this project is the love the employees of DPL have for their company. The Values Task Force made it very clear that they wanted to get back to an earlier time when a particular set of values mattered in how the company operated. 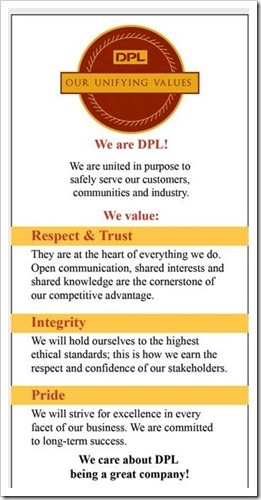 The statement seen here reflects this commitment to caring for their company. The company could change because its values matter in the choices the company makes. The greater challenge is to operationalize the values throughout the policies and practices of the company. This takes time and attention to develop the company as a values integrated operation. It means that daily they must grow into earning the respect that this recognition has given them. To return to Vickie’s question, “How do we make choices about what to give up in order to make space for growth – how do you choose?” We do so by being clear about our values. They provide us a basis for judging what we continue to develop and what we stop doing. From this perspective, values are a strategic asset. The articulation of our mission and our vision for impact, therefore, become ways we express our values in the actions and decisions we make. The surprising key to future growth is the operationalizing of values, integrating them throughout the work of the company. For values to matter, they have to be more than just as some ad hoc, abstract ideas that look good in the company’s website. Our values matter because they guide our decisions, our actions, how we conceive of our mission, our work, our impact and how we are to relate to one another. Being clear about our values enables us to be clear about where we need to grow. When values matter, it becomes much easier to find the space of time and attention that we need to give ourselves fully to the growth transition we are in. Operationalize your values and growth will follow. It is how we make the distinctions that matter to us in all that we do every day. Tagged with Aristotle, attention, Audit Integrity, choices, Dayton, decisions, development, ethics, Forbes, growth, integrity, Learning, light, mission, operationalize, power, priorities, recession, time, transformation, transition, trustworthy, values, vision. This post was mentioned on Twitter by edbrenegar: @adaptivecoach Here’s my column in response to your question – http://bit.ly/3rWz5K – Thanks it was a fun question to address…. Your article covers a lot of ground. The initial question takes you to trade offs. This is one of the most difficult concept to deal with that two choices or more can be dynamically opposed. I remember seeing a graph of the fastest runner in the world. The horizontal axis was time from fast to slow and the vertical one, distance from short to long. This graph charted the fastest runners in the world based upon world records that they set. The fastest in time was shortest in distance. The slowest in time was longest in distance. The runner could not do both be longest in distance and fastest in time. It is a matter of trade offs. In the work place leaders very much dislike hearing that they can't have the highest quality and the lowest price. And yet in most circumstance (not all) these are trade offs one needs to make. Even perhaps more interesting is looking at this as you have in the article as it relates to change. When some one decides on the trade off and decides what they want to do. Often they cannot over come counter commitments they have that prevents the choice or change to happen. This notion of counter commitment is from Kegan and Lahey's work at Harvard. The best way thru this is to understand what are these beliefs, myths, stories that you are holding on to that prevent the change. Once identified, try testing them to demonstrate yourself that they are not true – you will be able to reduce these barriers to the change much more easily. Additionally I wanted to thank you for the review of my book. I appreciate your help in spreading the word.